Located between the two 7.5 million gallon reservoirs two miles northwest of Tea, SD, this is Lewis & Clark’s primary pumping facility. The contract was awarded to Eriksen Construction of Blair, NE in April 2010 and substantial completion was reached in April 2012. Final construction cost was $8.4 million. 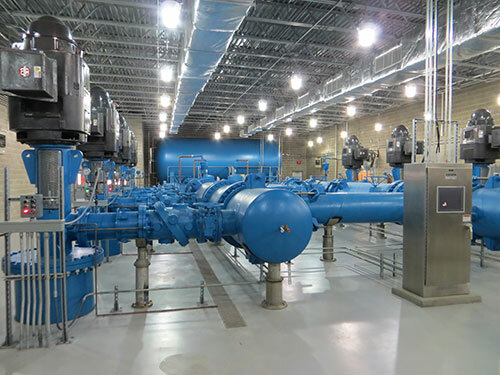 The project included eight 350 horsepower high service pumps, piping, variable frequency drives, controls and electrical switch gear. The Tea Pump Station is two-levels with a combined 16,037 square feet. A contract was awarded to Gridor Construction of Buffalo, MN in September 2015 and substantial completion deadline was reached in May 2018. Final construction cost was $3.7 million. The Rock County Pump Station is about five miles south of Luverne, MN and is 4,628 square feet. This contract also included constructing a meter building a few miles east of Adrian, MN as a second connection point for Lincoln Pipestone RWS, as well as adding two more pumps to the joint Rock Rapids/Rock County RWD meter building.